No proper modern day flagship could be truly complete without a powerful camera and the Z5 Premium definitely makes no exception. Sony has decided to equip the whole Z5 family with a new 23MP camera. That means that the latest Premium sibling should offer a pretty comparable photo quality. Sony might be marketing the new camera as simply a 23MP one, paired with an f/2.0 24mm-equivalent wide-angle lens, but there is actually a lot more going on behind the scenes. The sensor it uses (reportedly. model Sony IMX300) is actually what is known as a multi-aspect sensor and it actually has a bit more pixels - around 25MP to be exact. 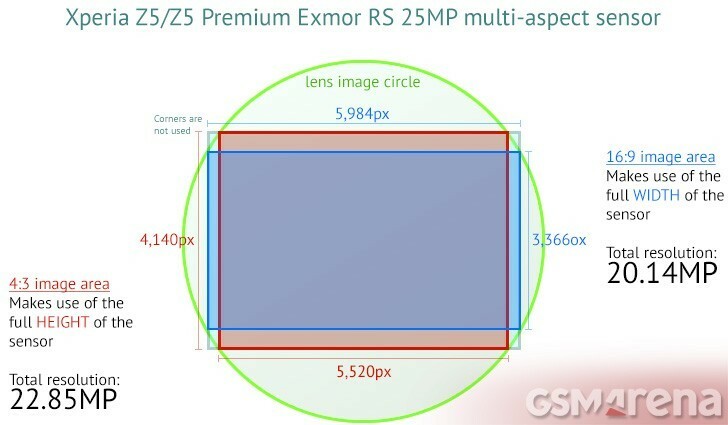 Sony doesn't market this officially and instead cited the 23MP resolution or 5520 x 4140 pixels (about 22.85MP) that the phone does in 4:3 mode. Meanwhile, however, the 16:9 aspect ratio mode yields images measuring 5,984 x 3,366 pixels (20.14MP). What you'll notice, is that the 16:9 shots have a higher horizontal resolution than the 4:3 ones, hence they're not cropped from 4:3 as usual, but instead use a different part of a larger sensor. This might not sound like much, but you do actually get comparable resolutions in both aspects, which is nice. The Sony Xperia Z5 Premium has impressively big Field of View (FOV) and can capture a lot more than the others. You can switch it to 16:9 mode and thanks to Sony's multi-aspect sensor you will actually gain some ground horizontally (at the cost at vertical coverage). Here's a quick illustration of the difference in Field of View. The impressive hardware, in combination with the capable Snapdragon 810 chip, makes it possible to shoot UHD 2160p videos at 30fps with the main camera and up to 1080p@30fps with the front-facing one. The phone has a dedicated two-stage shutter button, which makes precise focus a whole lot easier. It is a shame that there is no dual-tone flash, but just a plain single LED one. In the latest edition of the Xperia camera app, the viewfinder has undergone a few changes, though they don't change the overall user experience. The interface is now scrollable, like on the iPhone, and you switch between Manual, Superior Auto, Video recording, and Advanced shooting modes with a swiping gesture across the screen. The Video recording mode is now separate from Manual and Auto, so this is the end of the shared viewfinder and the anomalies it caused in terms of field of view. 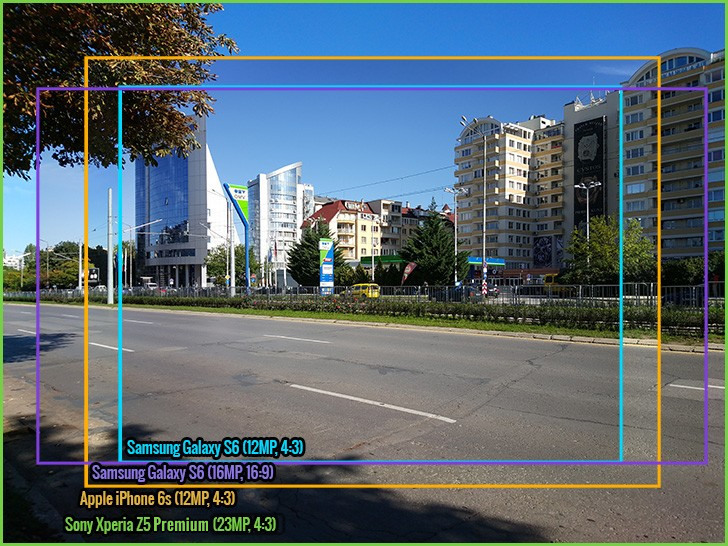 Also, Superior Auto no longer requires lowering the image resolution and the Z5 Premium can shoot at 5520 x 4140 pixels in both Auto and Manual. In Manual mode you also get access to "manual controls" on the viewfinder. There's an exposure compensation slider and a white balance selector. You can also control the ISO, metering and focus modes, turn on/off image stabilization, but those are buried in the settings menu. The Superior Auto shooting mode is an even improved version of what we've already seen in other Xperia phones that came before the Z5 family. There are no settings you can change, everything here is done automagically. Manual and Superior Auto aside, the Xperia Z5 Premium offers several other interesting shooting modes. There's Sweep panorama but, it's not really all that great. Stitching is clearly visible, resolved detail is poor and so is sharpness. And don't even get us started on the 5MP resolution! 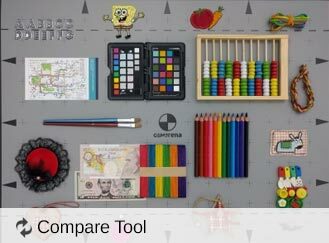 Other modes include the regular Picture effect mode, which creates a 3 x 3 grid that shows all the available effects in real time. Also a few portrait tools for styling and the quite funny AR mask that overlays another face on top of your own. Sony's new 23MP sensor shows great promise. But regardless of how powerful the hardware is, the camera image quality is still susceptible to recurring issues such as corner softness, high levels of noise and watercolor like effect on fine repetitive detail such as walls, foliage or grass. The edge softness has been persistent on the Sony's cameras. Basically, the quality degrades when you get far from the center, the very edges of the photo can be particularly messy. So it captures more of the scene, but don't place objects of interest at the edge of the frame as you'll lose detail there. We also noticed some barrel distortion that weren't straightened out by the algorithm. Such distortion is quite expected with a lens that wide (24mm), but it should be correctable in-camera. Thanks to the new phase detect hybrid auto focus, focusing is indeed lightning fast and unlike with the Z5 Compact, the Z5 Premium got it right every time, even in tough conditions with moving objects. And while the Z5 Premium lives up to the promise of fast autofocus, it still has a lot to catch up with the image quality. The Z5 Premium camera nailed the white balance every time, the colors are spot on and the autofocus is very fast. The dynamic range is disappointing though and you may have to switch to HDR more often than usual. 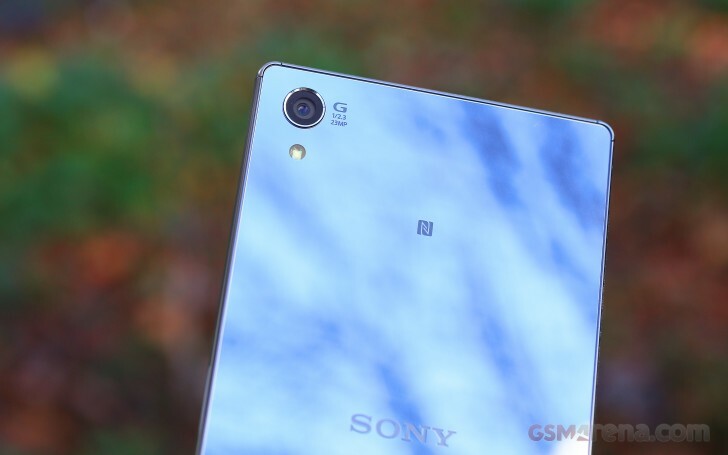 So, in the end the Xperia Z5 Premium produced one of the sharpest photos we've seen lately, but also the ones that show the most signs of over-sharpening. The noise reduction isn't great, leaving noise that gets sharpened afterwards, causing some noticeable artifacts when you view the photo at 100%. Most of the time, however, when you view the photos at a lower resolution (or downscale it to 8MP), they look great. On another positive note, the fast hardware has made the camera app nice and responsive and Sony's legendary Superior Auto mode seems to have gotten better as well. It still has its hiccups and can sometimes toggle to an odd shooting mode, but it generally manages to produce far better photos than a zero-config manual approach. Here are two sets of shots taken in Superior Auto, Manual Mode and Manual Mode with forced HDR. While Superior Auto would occasionally activate the HDR mode, if you really want to force it, you'd have to go to Manual mode and select HDR from Settings. The HDR effect itself looks quite toned down, especially compared to other recent Sony models, like the Xperia M5. That, however, is not necessarily a bad thing, as it does produce nice results. We also tested how the Z5 Premium handles low light conditions and the results weren't exactly impressive. Noise levels are off the chart in the night samples, even those shot with a flash. On a more positive note, at dusk, the Z5 Premium did fairly good with the white balance and contrast, so its flash seems to work well, despite being only "mono" tone (if that's a word). Downscaling those images to 8MP would make them even better. Last, but not least, we also tested out the 5.1MP front-facing camera. Photos came out with nice colors and a lot of detail, as one would expect. Here are a few samples at slightly different lighting. 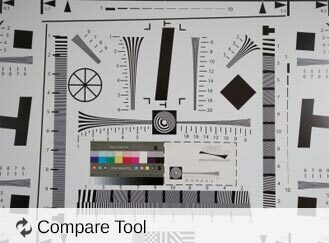 We've uploaded the full resolution (23MP) photos to our photo quality comparison database to compare against other high-resolution smartphones. With a 23MP camera and powerful Snapdragon 810, the Xperia Z5 Premium has all the required prerequisites to do 4K and should also do a pretty good job of it. It definitely lives up to those expectations, producing pretty impressive results. Videos come out with a lot of detail, nice colors and smooth motion. For videos the Xperia Z5 Premium features digital image stabilization - SteadyShot, but there's a price to pay - the field of view (FoV) is reduced (it's how all digital stabilization systems work). Also, it takes a toll on the quality. However, the Z5 Premium does show major improvements in this area - quality isn't severely affected and the stabilization works surprisingly well. The phone is smart enough to detect whether you are shooting hand-held or you have rested it on something stable but you get the reduced FoV either way if the option is turned on. Sony has actually done some behind-the-scenes improvements on its video stabilization. Just like with the Z3+, the Z5 Premium uses a combination of software and hardware to do the magic. The latter being an actuator system that shifts the whole lens unit to compensate for shakiness. This is slightly different from OIS and Sony has gone the extra mile to improve the de-shaking process in the Z5 family, by adding a position sensor and introducing a closed loop mode of work with feedback control from said sensor. One notable absence in the Z5 Premium's new camera app is HDR mode in video. The Z5 Premium shoots gorgeous 4K videos with a resolution of 3840 x 2160 pixels and a steady framerate of 30 fps. The bitrate is also quite impressive at 56 Mbps, coupled with a 48 kHz audio sampling rate, captured in stereo, of course. Resolve detail is really impressive. Overall, the Z5 Premium offers 4K video fit for a flagship. Auto focus, however, was far from docile and in typical Sony fashion, the phone hunted for focus while video recording quite a bit. Setting the autofocus to a single focus per video remedies the issue entirely. It is also worth noting that we shot on a pretty windy day, which brought in some shakiness. Naturally, the Z5 Premium can also do 1080p videos as well and does a pretty impressive job of it. Furthermore, there is even a 60fps option that also produces impressive results, smoothing out the motion. Below are two 1080p samples at 30fps and 60fps, as well as a 4K you can check out. The Sony Xperia Z5 Premium produced an excellently sharp image in both the 4K and 1080p samples and preserved a lot of information as it shot at the highest bitrate - 56Mbps for 4K, 18Mbps for 1080p and 31Mbps for 1080p at 60fps. Finally, the Xperia Z5 Premium is capable of taking snapshots while shooting videos. This is also very helpful for checking out the actual video quality, so we are attaching snaps of each video if it's easier for you. You can check how the Xperia Z5 Premium stacks up against the competition in our new video compare tool.